Certain Affinity are no strangers to video games. They have worked on some of the biggest titles to be released this generation of gaming, developing content for Halo Reach, Call of Duty: Black Ops and Left 4 Dead to name a few. Maybe you haven’t heard of the Texan-based company, but you’ve most likely experienced their work without even knowing it. Jess and I were fortunate enough to be granted time to quiz Max Hoberman, Certain Affinity founder, President and Creative Director on the studios’ latest Xbox LIVE Arcade title, Crimson Alliance. We had the opportunity to ask about the development of the RPG dungeon crawler, the controversy surrounding the free game download, future plans for Crimson Alliance & Certain Affinity, as well as finding out a little more detail on a game you may or may not have heard of: Halo Combat Evolved Anniversary. Jess: Certain Affinity in the past have worked on titles such as Halo, Left 4 Dead, Call of Duty and the multiplayer RTS Age of Booty. How does it compare to go from collaborating on some of the biggest games, to developing CA’s own XBLA dungeon crawler Crimson Alliance? Max: It’s a world of difference developing our own games. 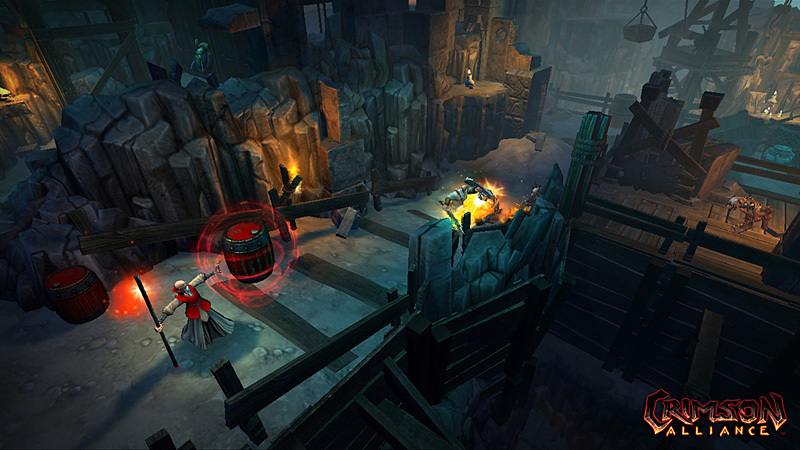 On the big FPS titles we have a very narrow focus – often maps and multiplayer game modes. When we’re making a full game, even a downloadable one, the buck stops with us. We have to make all of the decisions for the product (in consultation with our publisher), which requires a broad skillset and breadth of experience. We also end up doing a lot of self-promotion of these games, which is a lot of fun, but can be stressful given that we always have development work also on our plates. Hangie: How did the idea of Crimson Alliance come about? 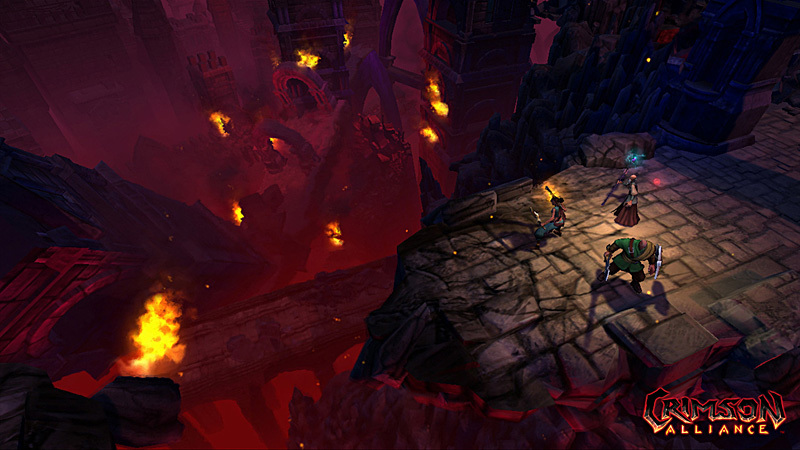 Max: I’ve been interested in making an action RPG game for as long as I can remember. I was working at Bungie when we released Myth: The Fallen Lords, which was a real-time strategy game without any building – and incidentally, one of my all-time favorite games. I always thought that we could apply this same approach to the RPG space, prioritizing intuitive controls, a great combat system with subtlety and depth, clever AI, and solid encounter design over the traditional staples of the genre, such as leveling, quests, dialog, etc. It’s not that I don’t enjoy these aspects of RPGs, it’s just that I inevitably get frustrated at the combat in RPG games. You have to prioritize if you want to make something great, and so great action was always the priority on Crimson Alliance. It’s a small game with a relatively small budget, and so some of the more standard features of RPG games simply couldn’t be represented as thoroughly as I’d have liked. However, this doesn’t mean that they can’t be layered on top of a great combat system, and so I hope to explore this further in the future. Jess: Crimson Alliance feature three unique characters; The Wizard, The Assassin and The Mercenary. Yet the game has been designed as a co-op game for four. Was there particular reasoning behind this design? Max: We originally envisioned 4 characters. As the project progressed we realized that we were going to have to scale back to keep the scope under control (we went over by more than 6 months, and on our own dime, as it is). We considered only supporting 3 players in co-op, since we only had 3 classes, but figured we let you play with any combination of classes anyway, and we already supported 4 players in co-op, so why put an artificial limit in place? Ironically we took some flak from reviewers for this, and probably wouldn’t have if we’d gone down to 3 players, but I’m very happy that we didn’t put an artificial restriction in place. Jess: As a gamer, it’s sometimes easy to take for granted aspects of a game that ‘just work’. For example, level design and game mechanics are integral to creating a game world, yet these can be easily overshadowed by art style or voice acting (though it can happen the other way around). Is there any particular aspect or areas of Crimson Alliance that you think are integral to the game, yet might not get the recognition it deserves? Max: The “feel” of playing a game is incredibly important. Just about everyone comments about how good it feels to play Crimson Alliance, but few people realize how much attention to detail goes into creating intuitive controls and visceral combat. Whenever I see someone pining for camera control I just shake my head, for instance, because if you’re controlling the camera then you’re not controlling your character. There are tons of subtleties beyond this though. Three things that I’m exceptionally happy with, but that rarely get noted, are the auto-aim system for ranged combat, the animation blending system that makes your actions look and feel buttery smooth, and the enemy bodies that go flying ragdoll-fashion. 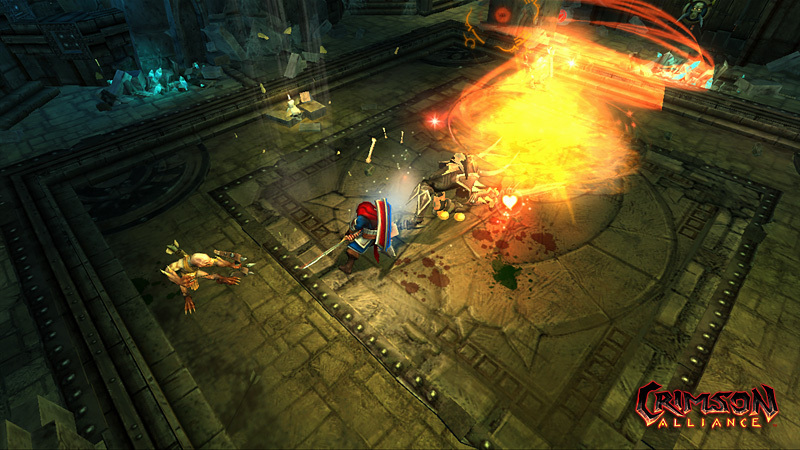 Jess: Despite being reminiscent of the hack n’ slash games of years gone by, Crimson Alliance has a wealth of features to discover; Score multipliers, challenge maps, secret areas, co-op puzzles, collectble heart containers, throwable objects and revives are just a few of the features to be found. Were there any particular games or even experiences that inspired the team in the creation Crimson Alliance and the bountiful features available within? Max: We found inspiration all over the place. This started, of course, with our FPS experience, which led to designing gameplay mechanics and spaces where cover matters and you sometimes have to take a tactical approach to encounters. Beyond this, however, we were inspired by Zelda for collectable hearts, by Geometry Wars and Trials HD for our presentation of leaderboards, by old stand-up arcade games for our approach to high scores, and by Left 4 Dead and pen and paper role playing games for our approach to reviving downed teammates. Everyone comments on the similarities to Gauntlet, and of course that series was hugely inspirational. Beyond this, however, I often pointed the team to a less well-known game called Hunter: The Reckoning and their approach to supporting co-op and linear encounters, as well as both melee and ranged combat for their characters. Hangie: The gameplay for Crimson Alliance has a multi-layer style that creates a wonderful sense of depth. Was this a design decision CA went in initially when developing the title? Max: Our goal from day one was to create action gameplay that’s simple to pick up and play, yet has tons of depth. So yes, this was very intentional. We really struggled during development to get to this point, but as soon as we nailed it we knew that we were on to something special. This took a great deal of determination and patience from the team and from our publishing partners, not to mention more time working on the game than we originally envisioned, but in the end it was absolutely worth it – this is what we do at Certain Affinity. Jess: Are there any plans to release future downloadable content such as new characters, abilities, or possibly ‘map-packs’ for Crimson Alliance? Max: We haven’t announced anything publicly yet, but we did design the engine to support the easy addition of additional content. Easiest on the list is additional playable levels, but we’re not ruling anything else out. Stay tuned, we may have an announcement in the very near future. Hangie: Does Certain Affinity intend on continuing with the Crimson Alliance series with a possible sequel? I really like the assassin character so I hope we’ll be seeing more of her. Max: Personally I would love to do a sequel – there’s so much low-hanging fruit, so many areas to improve on and build on the great foundation we’ve laid with this game. The rest of the team feels the same way. We’ve even had some people in Microsoft publishing express the exact same sentiment, but ultimately the decision is Microsoft’s to make. I imagine the first quarter sales for the title will end up being a deciding factor, so we’ll have to wait and see. That said, we just crossed the 50,000 player mark 5 days from release, so we’re off to a great start. Jess: Unfortunately there’s been a lot of confusion around the free game download game with character trials. I know Certain Affinity have been explaining the issue one on one for people with concerns, but would you be able to clarify for us the confusion with the free download version? Max: Sure. It’s unfortunate that the game is getting so much criticism for what we consider a very innovative approach. If you want to download a trial, and then you enjoy it and want to purchase the full game for 1200 Microsoft Points you can do just that, with only one difference from other XBLA games – the trial is labeled “full game”, but free, in the Xbox Marketplace. I didn’t realize before we launched that anyone would feel misled by it (and we were certainly up front in talking about the pricing model), but we did know that MS wouldn’t let us call it a trial due to our supporting online co-op and the multiple class pack offerings. What’s really innovative is not the name of the trial version, it’s our offering of a single class, rather than all 3 classes, for a reduced price (800 Microsoft Points instead of 1200). We struggled to find the right price point for this, and I can tell you everyone was very nervous about selling almost all of the game’s content for just $10 when we’d always planned on it being a $15 download. I don’t know that we made the right call on this – time will tell. It’s certainly been contentious though, when we considered it a bargain! Beyond this, we’re also experimenting, along with our publisher, with one additional feature – selling in-game gold for real money. I spoke about the thinking behind this on the game’s web site (crimsonalliance.com), but the long and short of it is that this is absolutely not required to play the game, and you will not be limited or restricted in any way if you don’t choose to take this shortcut. Hangie: With Crimson Alliance completed and well received by the gaming public, are more independent projects on the horizon at Certain Affinity? If so, could you please share some details with us. Max: Right now we’re focusing on Crimson Alliance, on wrapping up our work on Halo Anniversary, and on a third, unannounced (but very big) project. Sorry I can’t say more. Hangie: Halo fans that have been following news on the upcoming Halo: Combat Evolved Anniversary will know Certain Affinity are also working with 343 Industries to breathe fresh life to the remake of the original. What role is CA taking in the game’s development this time round? Max: For Halo Anniversary we’re creating all of the multiplayer maps and the Firefight map. We’re at the very tail end of this work right now and we’re psyched to see it in the wild come November. Max: Thanks for the interview and your thoughtful review of the game. You’ve been a great supporter since day 1, as have all of our early adopters. Please let others know how much you enjoy the game and this will help convince Microsoft that more content is a necessity! 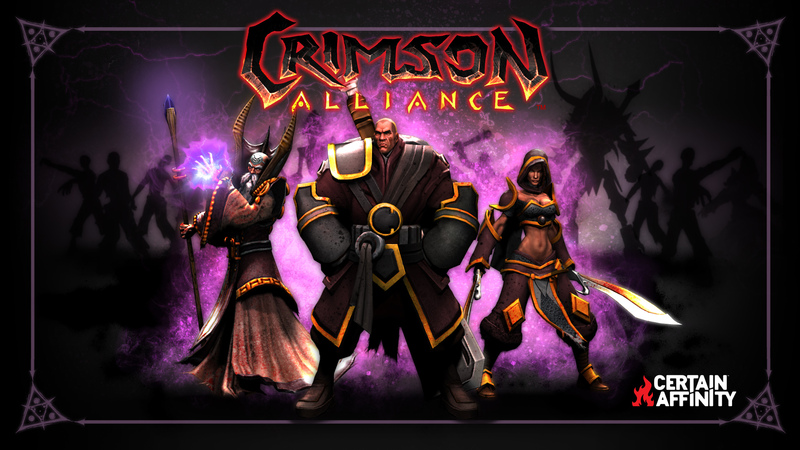 To find out more about the action-packed XBLA title, hit the link to read our review on Crimson Alliance. Engross yourself in all things Crimson Alliance with Certain Affinity’s game guide and official forum. Thanks goes to Max Hoberman for taking time out of his busy schedule to answer a few burning questions for Esperino, and Tim Fields from Certain Affinity for organising the interview. We wish the team at Certain Affinity success with Crimson Alliance and all their future projects.